As Greece wonders whether its debt crisis will eventually spell its exit from the euro, one town, Volos, has formed an alternative local currency. A few months ago, an alternative currency was introduced in the Greek port city of Volos. It was a grass-roots initiative that has since grown into a network of more than 800 members, in a community struggling to afford items in euros during a deepening financial crisis. 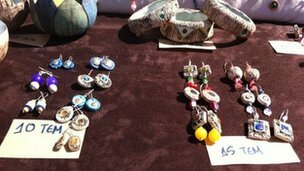 The handicrafts stall at Volos central market lies at the end, just past the homemade jams. After perusing what there is on offer, Hara Soldatou picks out a set of decorated candles, delighted with her purchase. "They cost me 24 TEM, which I built up by offering yoga classes," she says. Wherever you wander through the market area, one thing you won't need in your pocket is money. From jewellery to food, electrical parts to clothes, everything here is on sale through a local alternative currency called TEM. It works as an exchange system. If you have goods or services to offer, you gain credit, with one euro equivalent to one TEM. You can then use your "savings" to buy whatever else is being offered through the network, leading to some rather original exchanges of goods. It's all reminiscent of an ancient bartering system returning to today's Greece. "I can get language classes or computer lessons in return", says Stavros Ntentos from his stall where he sells children's underwear. "It's a very good idea because we need to make people realise we can all buy and sell something; we don't only need euros." "We have reached the bottom of our lives and we now have to think in a different way," says Tasos, a vegetable-seller. The whole system is organised online, with members holding TEM accounts, which are debited with each virtual transaction. The founder, Yiannis Grigoriou, stands next to the computer bank at the market, surveying proceedings. "It's attractive because people find hope here. They find things to give and take," he says. So could the TEM become the dominant currency in Volos? "I don't know", he says, chuckling. "We'll see about that." Exiting the eurozone has been a frequently-discussed scenario over recent months, as Greece has sunk deeper into its worst recession in modern history. And while some in the country see TEM as an alternative - "the euro is a thing of the past," explained one shopper - it seems more like a back-up than a viable replacement. The mayor of Volos, Panos Skotiniotis, insists the euro is not in danger from TEM. He stands by the project, but says the two currencies can co-exist. "We support the initiative because it's a very good way out of the deep economic and social crisis," he says. "It's an initiative that supplements the euro but doesn't replace the euro. Greece is in the eurozone, we want to remain in the eurozone, we think we must remain in the euro." But the alternative currency network is spreading throughout the community, with more and more businesses now depending on it. At a local flower-growing co-operative staffed by people with learning disabilities, the workers use TEM to sell their plants for other services that they would otherwise struggle to afford. And members of the public come to help out at the business, cutting the grass or mending a fence in return for the plants offered. "We can buy bread or meat in exchange for our products, or the girls can go to the hairdresser," says Peri Mantzafleri, who runs the co-operative. "I grew up in a village - this was how it used to work in the old days, before money became involved. So this could be a chance to start again." And the next generation is benefiting too. In the local town hall, children take part in lively activity workshops - a mixture of games, songs and drawing. Parents who are now struggling to afford the sessions can pay in part through TEM, with the two currencies working side-by-side. Charalampos Bardas, the co-ordinator of the workshops, says the local currency is invaluable. "It's a big solution against this crisis. Life goes on, we have to fight," he says. "We have to see things differently now. It's not the end of the world if we have this crisis. We want to succeed and move on." And so this small community has developed a new tool to fight against the worst financial crisis that many have ever known. The euro may not be forced out here, but Volos has found a way of coping through alternative means.